Last summer, those of us living in the Magic Valley were well aware of the wildfires here in Southern Idaho. We could see – and smell – the smoke for weeks! Thankfully, wildfires themselves don’t typically make it into the city limits (thanks to the efforts of hardworking local and volunteer firefighters!). But smoke damage can occur in our homes quickly if we’re not careful. Smoke damage is most commonly caused by kitchen flare-ups, closed off fireplace ducts, and electrical fires. Once everyone is safe and the any fire has been put out, the next biggest concern for a homeowner is damage control – property damage control, that is. Particularly if there’s smoke damage, which there’s bound to be after any fire or other dangerous incident involving heat. 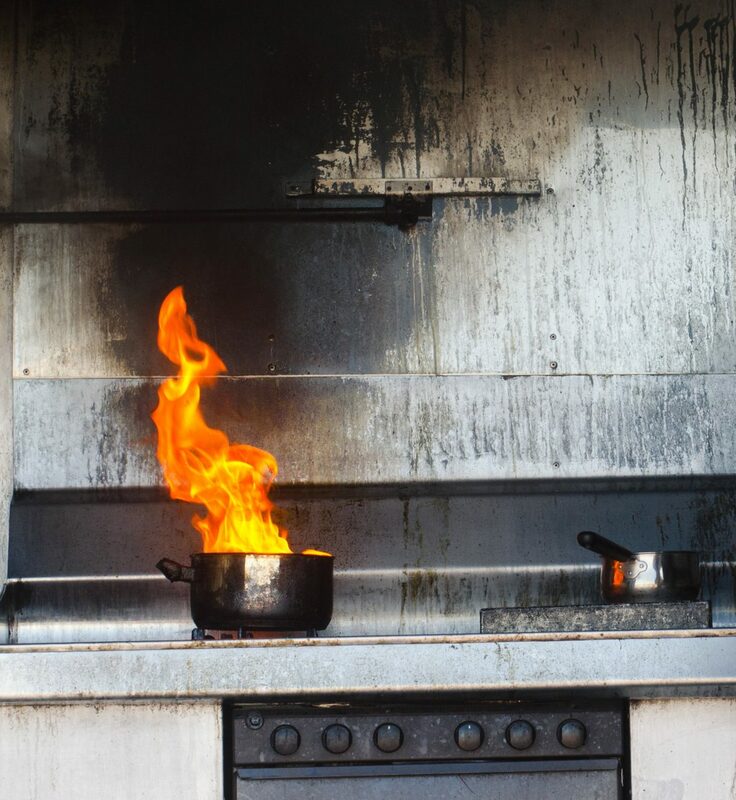 Overheating oil while cooking, for example, can often lead to some major smoke! Smoke can seep into the walls, ceilings, and floors of a home, as well as the furniture, making it difficult to get rid of that smoky smell. According to the Institute of Inspection Cleaning and Restoration Certification (IICRC), “immediately after a fire, soot residue settles onto the property. Discoloration of porous materials is permanent, but other surfaces may be properly cleaned to remove the discoloration. Acidic soot begins staining other surfaces if not treated quickly…If left untreated, within weeks the restoration process will take longer and cost more”. If your home has just suffered minor (or even major) smoke damage, here are some things you can consider to start getting your home back to the way it was. 1. Safety first! Be sure to wear goggles, gloves, and face masks if necessary, depending on the damage. And make sure any young children, elderly, or sick individuals visiting or living in your home are outside (if weather permits), in an area of the home not affected by the smoke damage, or are otherwise away from the area of the home with the most smoke. Inhaling too many fumes from any kind of fire is never a good thing! 3. Clean the area. Wipe down surfaces, countertops, furniture, appliances, walls, ceilings, light fixtures, light bulbs, and so on. Soot and most stains can disappear with basic cleaning products and a little elbow grease! You should also wash all of the clothing worn during the time of the smoke damage, as well as the ones you wear to clean it up if different. Also consider washing curtains and wiping down blinds. Depending on the amount of smoke and visible damage, it may be a good idea to throw away food that was openly exposed to the smoke. (Use your best judgment on this.) Finally, deodorize carpets if heavily exposed to smoke. 4. If all else fails, call the professionals! While many homeowners who experience smoke damage can solve the problem by opening some windows and wiping down some cabinets, some damage may be too much to handle. Here at Elite Restoration, we specialize in fire and smoke damage, and can help you get your home back to its smoke-free best! We offer 24-hour emergency service, with a response time of less than one hour. If the job seems too big, let us help you fix it. It’s what we do! Anytime we call Elite Restoration to the Boys & Girls Club they are quick, friendly, and always dependable. It doesn't matter what the issue is or what time of day it is, we can always count on them to come out and assist us. Dave is amazing! They are awesome! Anytime we have a problem they come and fix it. Shout out to DAVE!